: Racing dog, hunting dog, companion. 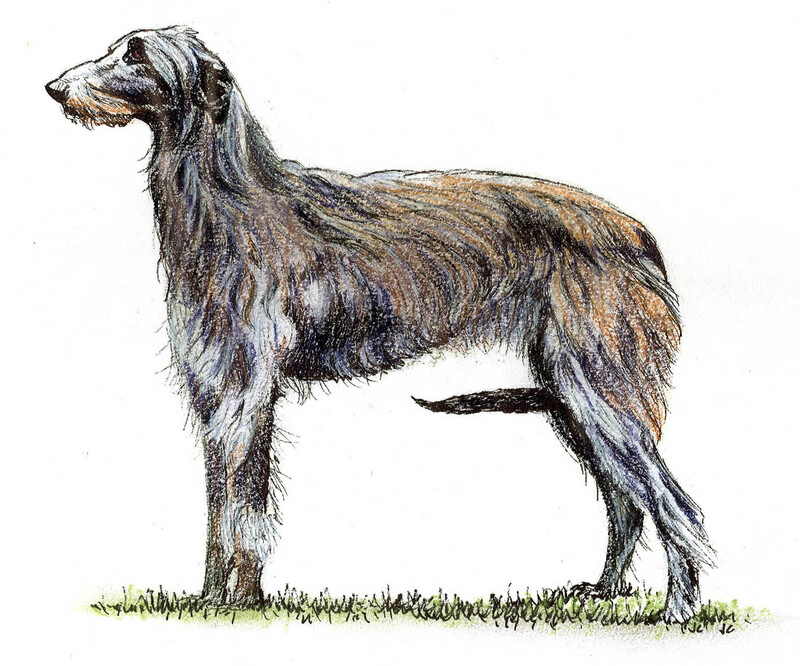 : The Deerhound, known at one time as the Scottish Deerhound, has mystery surrounding his origins, but there are grounds for thinking the Deerhound may have been introduced to Scotland by Phoenician traders. Certainly there were running hounds there when the Romans arrived. The breed has hunted the red deer for a thousand years, and although today more accustomed to the show ring, he has remained similar in type over the centuries. : Resembles a rough-coated greyhound of larger size and bone. : The build suggests the unique combination of speed, power and endurance necessary to pull down a stag, but general bearing is one of gentle dignity. Gentle and friendly. Obedient and easy to train because eager to please. Docile and good tempered, never suspicious, aggressive or nervous. Carries himself with quiet dignity. : Flat rather than round, with very slight rise over eyes. Broadest at ears, tapering slightly to eyes. Skull coated with moderately long hair, softer than rest of coat. : Slightly aquiline and black. : Tapering more decidedly to nose. In lighter coloured dogs black muzzle preferred. : Level. Good moustache of rather silky hair and some beard. : Dark. Generally dark brown or hazel. Light eyes undesirable. Moderately full with a soft look in repose, but keen, far-away look when dog is roused. Rims black. : Set on high and in repose folded back. In excitement raised above head without losing the fold and in some cases semi-erect. A big thick ear hanging flat to the head or a prick ear most undesirable. Ear soft, glossy and like a mouse’s coat to the touch; the smaller the better, no long coat or fringe. Ears black or dark coloured. : Very strong with good reach sometimes disguised by mane. Nape of neck very prominent where head is set on, no throatiness. : Body and general formation that of a greyhound of larger size and bone. : Well arched and drooping to tail. : Drooping, broad and powerful. Hipbones set wide apart. : Deep rather than broad, not too narrow and flat-sided. : Long, thick at root, tapering and reaching almost to ground. When standing dropped perfectly straight down or curved. Curved when moving, never lifted above line of back. Well covered with hair; on upper side thick and wiry, on under side longer, and towards end a slight fringe is not objectionable. A curl or ring tail undesirable. : Forelegs straight, broad and flat. : Well laid, not too far apart. Loaded and straight shoulders undesirable. : Compact and well knuckled. Nails strong. : With great length from hip to hock. Bone broad and flat. : Easy, active and true, with a long stride. : Shaggy, but not over-coated. Woolly coat unacceptable. The correct coat is thick, close-lying, ragged; harsh or crisp to the touch. Hair on body, neck and quarters harsh and wiry about 8 cms to 10 cms long; that on head, breast and belly much softer. A slight hairy fringe on inside of fore- and hindlegs. : Dark blue-grey, darker and lighter greys or brindles and yellows, sandy-red or red fawns with black points. A white chest, white toes and a slight white tip to stern are permissible but the less white the better, since it is a self-coloured dog. A white blaze on head or white collar unacceptable. : Males minimum desirable height at the withers 76 cms. Females minimum desirable height at the withers 71 cms. : Males minimum desirable weight about 45.5 kgs. Females minimum desirable weight about 36.5 kgs.